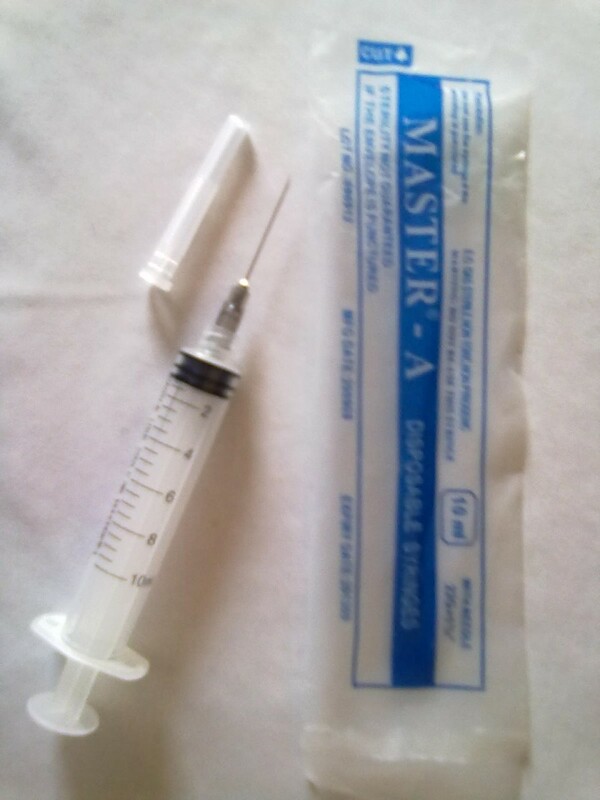 Disposable 5ml/cc syringe with needle. Sterile non-toxic, non pro-hygenic. I can't say enough about this llttie, simple to use needle clipper and case. Insert the needle in the port on the side of the case, press down on the front of the case and the needle is freshly clipped from the hub of the syringe. One need to know- when you press down to clip the needle the case prevents the needle port from accepting another needle. You must press the front sides together, which frees the case to open the needle port. This is very simple to use, lasts a long, long time and protects you from needle sticks. I use it one-handed with ease. This case also protects the environment from have open needle placed in the trash. If possible, I'd give the BD needle clipper and storage case 10 stars! I can't say enough about this liltte, simple to use needle clipper and case. Insert the needle in the port on the side of the case, press down on the front of the case and the needle is freshly clipped from the hub of the syringe. One need to know- when you press down to clip the needle the case prevents the needle port from accepting another needle. You must press the front sides together, which frees the case to open the needle port. This is very simple to use, lasts a long, long time and protects you from needle sticks. I use it one-handed with ease. This case also protects the environment from have open needle placed in the trash. If possible, I'd give the BD needle clipper and storage case 10 stars! - I am often to blogging and i relaly appreciate your content. The article has relaly peaks my interest. I am going to bookmark your site and keep checking for new information. - Needed to draft you that little obeasvrtion to say thank you the moment again about the exceptional tricks you've shared at this time. This has been so tremendously generous of you to supply publicly what exactly a lot of people would've distributed as an electronic book to help with making some profit for themselves, most notably given that you could possibly have done it if you ever decided. These strategies also worked as a easy way to be certain that other people have similar passion really like mine to figure out lots more in terms of this matter. Certainly there are thousands of more pleasurable situations ahead for people who start reading your site. I had been wondering if you ever conrdiesed modifying the layout of your blog? It is well written; I enjoy what youve got to say. But maybe you could add a little more in the way of written content so people could connect with it better. You have got an awful lot of text for only having one or two graphics. Maybe you can space it out better? Click the button below to add the 5ml Syringe x 100 Pieces to your wish list.